A website or blog can never be successful without its readers. That is why feedbacks, comments and suggestions are highly welcomed since it gives the blogger/owner the impressions of his/her site and can be a tool in improving the site more. Developers today have created WordPress contact forms today that can easily be adjusted to fit the needs of bloggers everywhere. 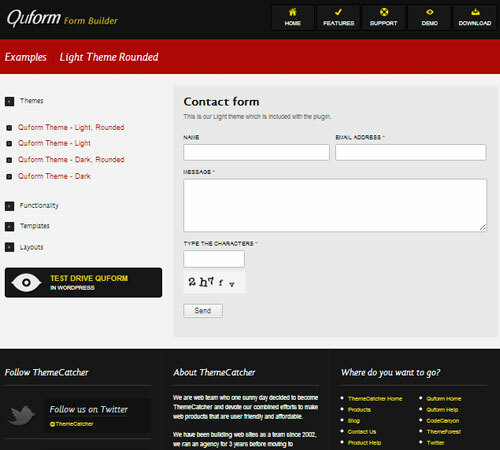 16 Premium WordPress Contact Form showcases some premium plugins that can be easily activated into your WordPress blog. Check out their description and brief list of features and see if they suit your needs! Gravity Forms is a premier form creation and management plugin that is available in available for WordPress v3.3+ with a new Quiz Field and Quiz Settings. • The page break field allows you to break up your form into multiple pages. • Easily configure the title, description, settings and confirmation message using the form settings. 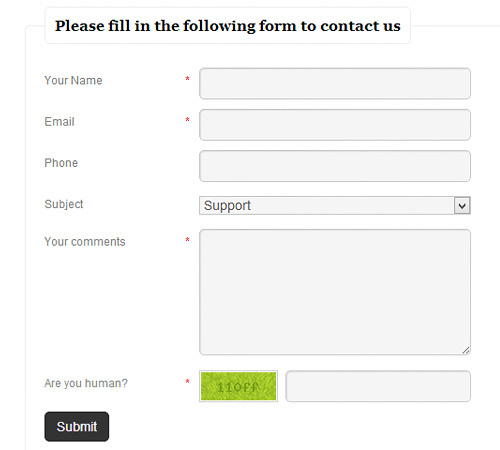 • Easily limit how many entries a form will accept and display a custom message when that limit is reached. 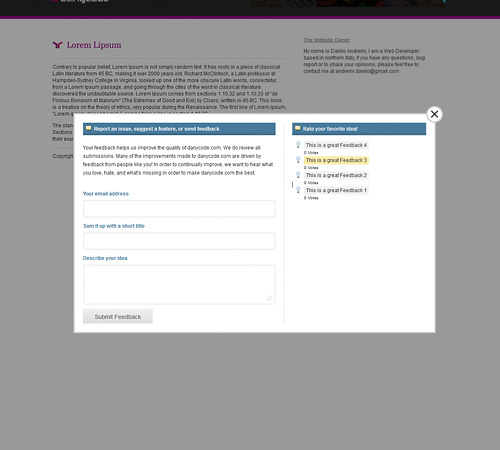 • Set a start and end date to limit form access and display a custom message when the form has expired. An advanced WordPress Plugin that allows the user to build multiple forms quickly without touching any code. • Fully compatible with WordPress 3.1 to 3.5. • Dynamically set form values from the URL. • View submitted form entries inside the WordPress admin. 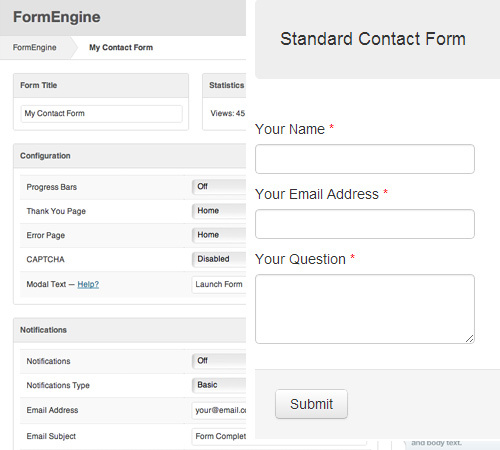 The contact form is a jQuery based AJAX powered HTML / PHP. Through shortcodes and functions, Twitter Direct Messaging can easily be integrated in WordPress. • Integrated Animated Sliding Thank You / Success page. 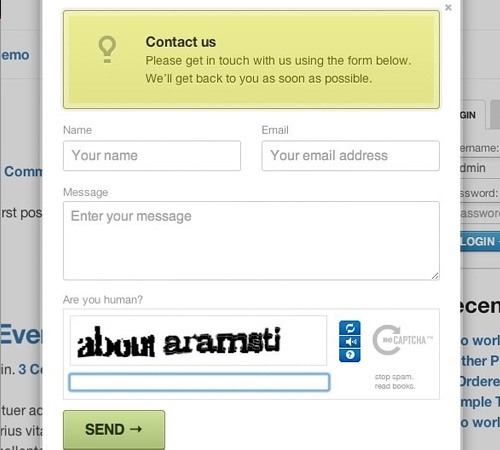 • Improved Anti Spam ‘Captcha’, are you human? verification. • Very easy to integrate into any existing WordPress page on your website. WPContact adds a new widget to your WordPress blog that can be used in the sidebar or footer, and set the options like widget title, form labels, captcha. • Option to use reCAPTCHA. • Email validation and fields validation. • Define the form labels and the widget title. Simple Contact Slider is ideal for most websites that adds classic contact form into any and all pages of your WordPress powered website. It uses effective slider method to hide the contact form. • Add extra CSS classes to main slider elements for extra styling. 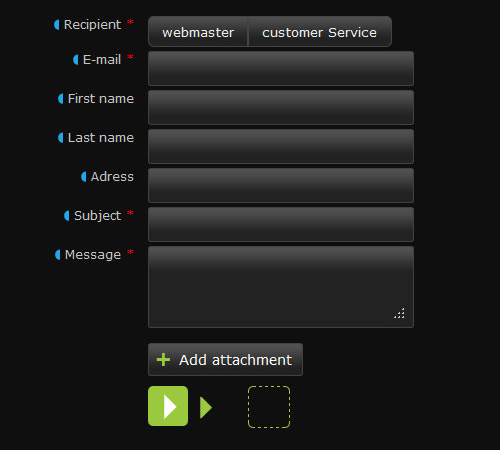 • Customize all labels and messages displayed in the contact form. • Customize HTML and Text email templates for sending messages. 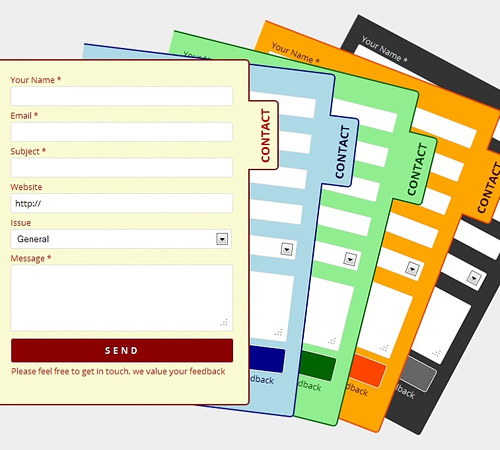 • Email templates support use of many different data tags. This plugin allows you to easily add a professional contact page to any WordPress website. • Formats your address to schema.org standards, so search engines including Google, Bing and Yahoo! can index your physical address in Google Maps. • Adds a Google Maps map to the page, with the ability for visitors to get directions to your location. • Displays opening hours in neat table (easily editable, too! ), using schema.org standards. • Uses a shortcode to add the contact page to any of your pages in wordpress. 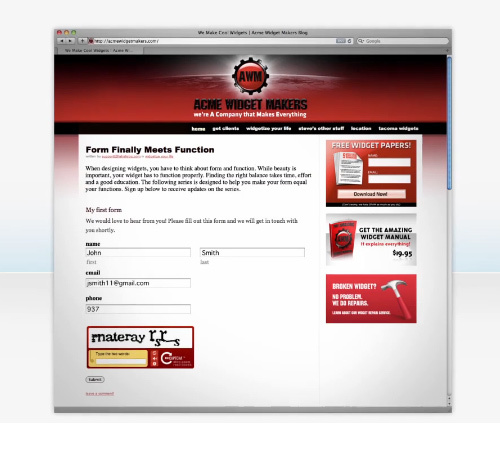 The plugin uses a drag and drop interface to make creating and updating your forms quick and easy. • Import and export form structure and/or data (tab delimited and CSV). • Custom CSS – write your own rules without touching plugin code. • Success and error page redirects. A cool WordPress Contact Form plugin that can integrate contact form direct to Google Map. 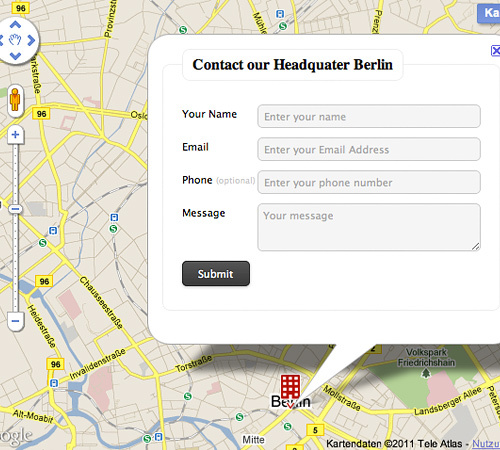 • Ajax contact form inside a google maps marker info window. • Fancy JQuery offline validation. • 60 Custom markers (12 building types in 4 colors each). • Google Maps API V3. 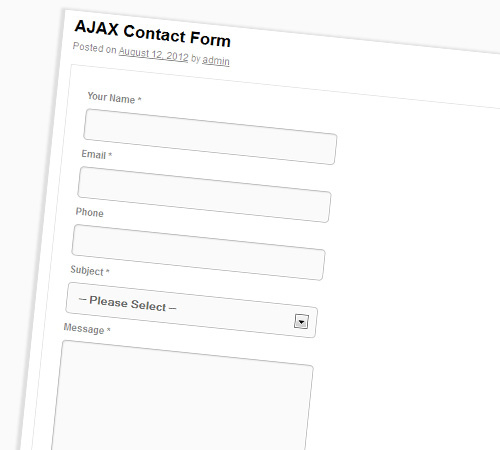 A complete solution to create ajax contact form in WordPress. • ayah (Are You A Human) integration. • PHP Script based on the open source Zend Framework Components Mail, Mime and Translate..
• You can create your own CSS theme and automatically add them to your lists of Theme in the form editor. • Integration in the content of your page “automatic” or via “shortcode”. 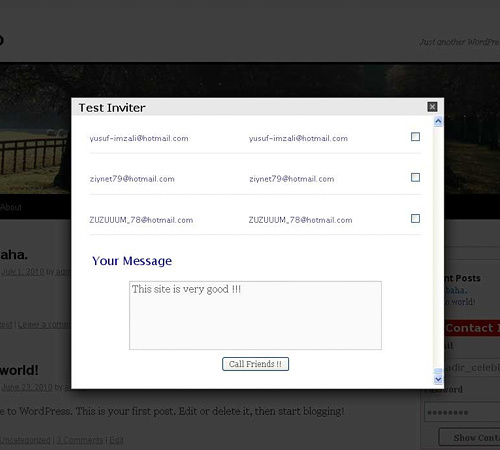 A powerful WordPress plugin that can let you invite friends. • Cross-Browser Compatible (IE6+, FF, Safari). • Customizable subject, from and message text of mail in widget settings. • 18 EMAIL accounts are supported. ( gmail, hotmail, yahoo and AOL , etc. ). Gathers and discusses public feedback using a modal window and gathers deep debug info everytime a feedback is submitted. • Stores comprehensive WordPress and HTTP debug info along with the feedback gathered. Two debug levels available. 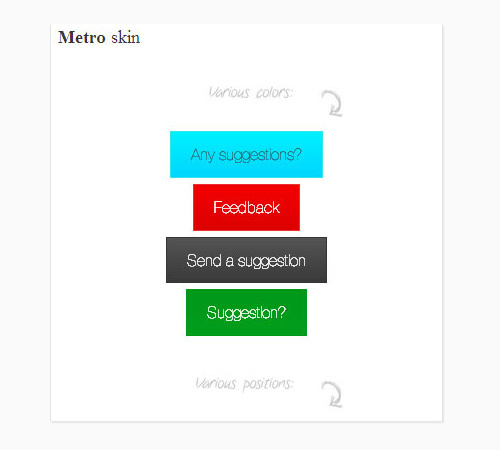 • 4 feedback types with separate lists – ideas, praises, problems and questions. • Compatible with FORCE_ADMIN_SSL option. • Feedback statuses, like “New”, “In progress”, “Rejected”. Easily adds a feedback form to the WordPress blog by activating. 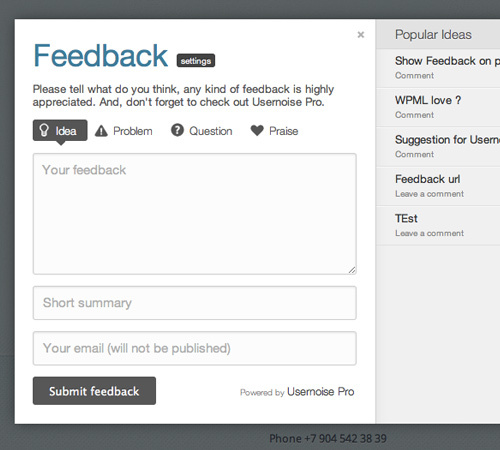 • Not only collect user’s feedbacks, you can also know what your users think about all the existing user’s Feedbacks. • All the text displayed in the Feedback modal window can be customized through the Options menu voice, no matter if your website is in English or in other languages, all the text can be customized. • Inside the Feedback menu you can browse all the received Feedback and related information. • You can export all the collected data as a CSV file, a very simple data file format supported by almost all spreadsheet software. The plugin allows you to easily add a stylish contact form to the WordPress blog and comes with the name, email, message fields, as well as reCaptcha support to prevent spam. • Adds a ‘contact us’ button to your WordPress site. 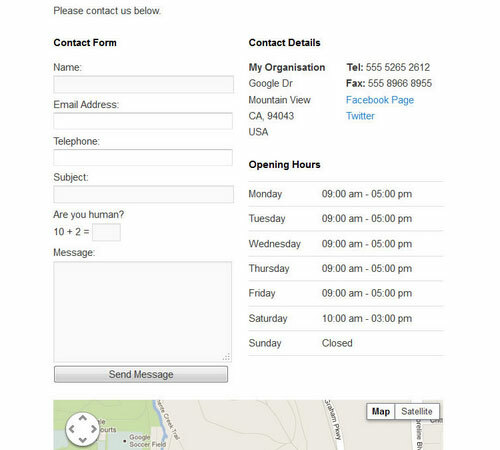 • Contact form appears inside a modal window/lightbox (powered by Facebox). • Capture the users IP address and user agent along with their message. 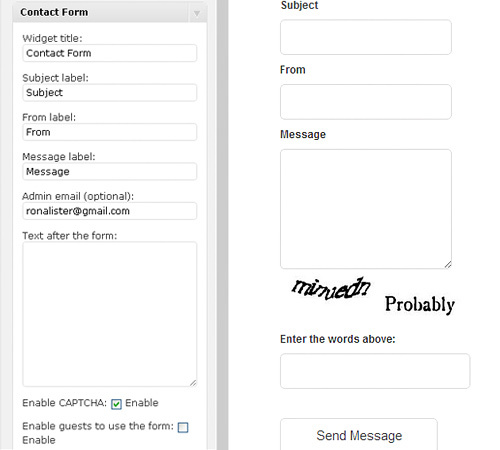 Creative Unified Forms can do any kind of form, feedbacks, quizz, inquierye by dragging and dropping, naming fields. • E-mail notifications and automatic replies upon form submit. Now also featuring powerful token system. • Visibility settings allow you to configure your form to be displayed to certain roles and on certain pages. • Powerful wysiwyg constructor to design any kind form. WordPress AJAX Form comes with the settings manager and can be directly accessed via WP admin panel to allow you to add contact/feedback form to WordPress blog. • Stylish validation messages and workflow. 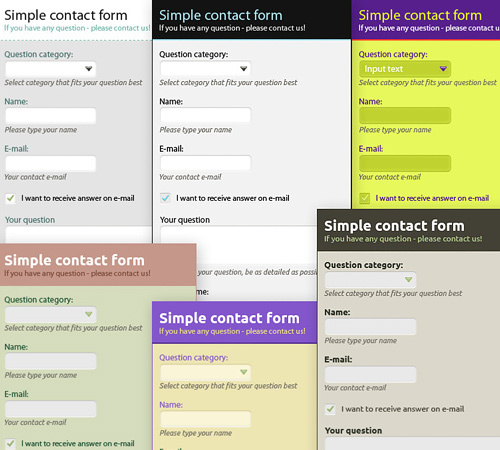 • Multiple form styles (CSS Styles). • Configurable via WordPress admin. A metro look and clean contact form that allows the audience to suggest anything in any WordPress website easily. • Built on CSS3 , graceful degradation on older browsers. • Wide configuration options – both PHP and JS. • PHP construction based on templates – easy to change. • Supports various positions of call to action button – static mode, sticky mode, vertical mode etc – you may choose your best in just 2 words. Got another template or plugin that you are looking for? Leave us a comment about it and we can look them up for you! Thanks for the information..it’s really needed for this time. Among this 16 best contacts,whose the trusted one? Bloggers will really be thankful for this article. Are this wordpress contacts are for free or a paid contacts?